Lancaster Products K-Series Mixers’ counter-current mixing action is the most effective mixing technique for consistent uniformity, homogeneity and rapid mix time. Lancaster Products K-Series mixers are the ideal tool for the preparation of powdered materials. Their high intensive action allows for mixing even the most difficult of materials. Powders, slurries, and pastes (with or without water or binders) can be mixed in extremely short cycle times. Dissimilar powders, differing in density and/or ratio in a formulation, are easily blended into homogeneous mixtures. The K-Series line of mixers excel in producing highly repeatable homogeneous mixes and pellets. Processing times can be greatly reduced while providing a more homogenous batch (mix) using a Lancaster Mixer. The Lancaster Products counter-current mixing action is the most effective mixing technology for rapid and consistent uniformity. Material is efficiently conveyed to the counter-rotating primary mixing rotor, secondary mixing plows and side wall scraper – all strategically placed to deliver maximum material mixing. 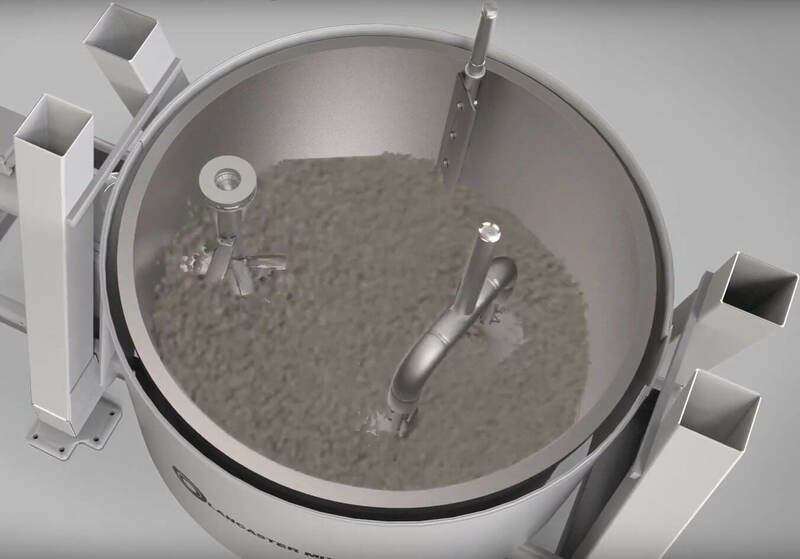 Our High Intensive mixers allow for individually changing component speeds to add tremendous versatility in meeting almost and material mixing challenge. 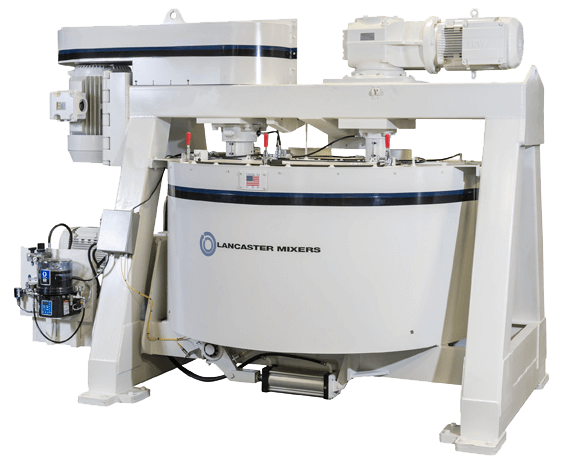 Lancaster Products high intensive mixers handle a full gamut of materials – from powders to slips and slurries, to taffy-like materials with viscosities exceeding 1,000,000 CP. Blend, pelletize, Granulate, Slurry, Disolve, De-Dust and React – all in the same machine. There are effectively no dead corners or unswept surfaces where ingredients can lodge. The unique combination of rotating pan, side scraper, and counter-rotating plow effectively eliminates all dead zones. Process times can be greatly reduced while providing a more homogeneous batch. Our experience in both lab and production environments is that free-flowing powders and granular materials can reach desired homogeneity in under a minute. In most cases, because the Lancaster counter-current mixing action is so thorough, less binder materials or water is required. The plow and side scraper also provide for continual material removal from the pan bottom and sidewall surfaces. Lancaster Application Engineers design toward many goals, including: mixing cycle times, moisture and air entrapment, particle size distributions, surface draw-down, pumping action and tip speed requirements. The intensity and type of mixing action can be controlled through the use of various style mixing rotors and speeds. Our technology coats pellets, de-fibers, de-lumps, fluffs and slurries..
Vertical axis horizontal pan mixing is the preferred design of the Lancaster Mixers. This positive and very efficient design of the pan gear drive ensures that the maximum amount of energy output is imparted into the mixing action. 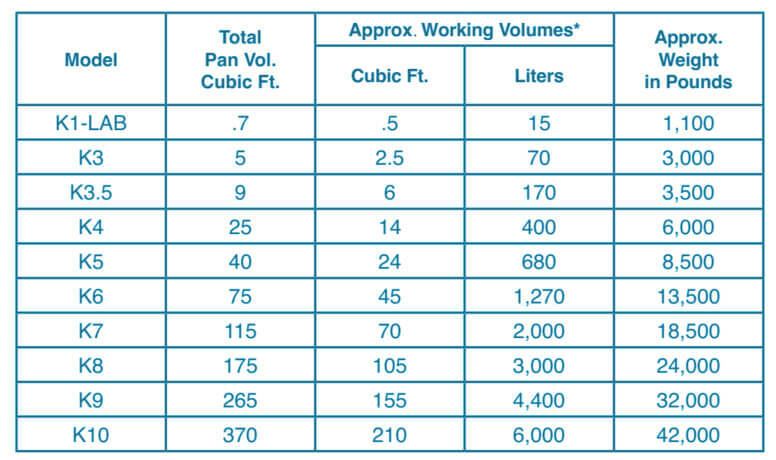 Pan rotation speeds can also be calculated for maximum material process effect without requiring higher speeds to move material to a higher elevation for proper mixing. The horizontal pan provides maximum production volume while minimizing contamination of the upper pan seal. The corresponding horizontal surfaces of our Lancaster Mixers provide easier and more efficient maintenance of the equipment. The slow speed plows of the horizontal design of our Lancaster Mixers not only enhance the mixing process, but they also provide for continual cleaning of the pan bottom and assist in material discharge. The actions of our plows eliminate the duties of cleaning and discharge by a rotor and a stationary bottom scraper. The primary mixing element of all Lancaster Products K-Series mixers is the single piece counter-rotating high-speed rotor. The design of the mixing rotor will vary depending upon the particular process requirements. The single piece base rotor construction helps maintain rotor balance after blade replacement. The rotor is driven by an easily accessible V-belt drive system. The drive motor can be single speed, multiple speed, or variable speed depending upon specific processing requirements. The drive guard fully encloses the top portion of the motor and the rotor spindle. A high-quality gear-motor drive is mounted on top of the mixer structure. This unit turns the slow speed secondary mixing plows. These wear-resistant plows continually sweep the entire surface of the pan bottom. This efficient slow-speed sweeping action prevents material from accumulating on the pan bottom and also provide enhanced mixing action and faster mixer discharging.